Sample shown in Ivory stock, Navy Border and Navy Ink. $39.96 $49.95 As Low As $0.54 ea. A Stationery Studio exclusive! 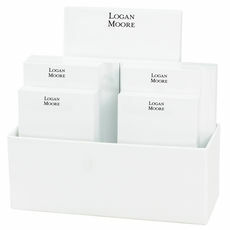 A set of 25 flat note cards in your choice of triple thick stock. Your choice of border color and raised ink color for your personalization. Size is 6.2" x 4.5". Blank envelopes included. 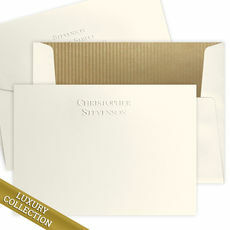 Printed return address and envelope linings available. Typestyle and positioning only as shown. Imprint on sample is done in Upper/lowercase type. If typed in all Uppercase the imprint will look larger. These look very simple yet classy for my husband. Classic, clean look. Good space for message. Classic style, simple design....great price!